FTIR is an excellent tool for identification of unknown chemicals. As infrared energy is passed through or bounced off of a chemical, the bonds of the chemical absorb specific wavelengths of the infrared spectrum unique to that chemical. Wavelengths that are not absorbed (transmitted) pass through to the detector. A pattern, or spectrum, is created based on the absorbance pattern and compared to a database (library) for identification. Advances such as Attenuated Total Reflection (ATR) sampling, which eliminates sample prep, have simplified FTIR such that it has become standard equipment for advanced CBRNE response. FTIR is commonly used to identify unknown liquids and solids. ATR sampling requires direct contact with the sample to perform the analysis. As with any technique, there are some limitations with FTIR. Mixtures are a challenge since the overlapping spectra prevent a clean library match unless the mixture is in the library already (e.g. coffee creamer). KD Analytical offers a suite of services for FTIR instruments (as well many other analytical instruments) that can save you money and time and help you to guarantee the readiness of your equipment and team. Training for the HazMatID in our HazMatID Operator's Course and as part of our Integrated Survey Course. 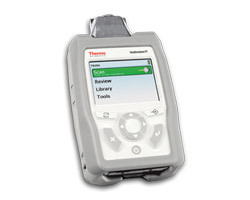 Complete Maintenance Management for FTIR instruments and all of your critical assets. ReadiTrak web-based asset readiness manager to track and manage status, preventative maintenance and repair history of your FTIR instruments and any gear your rely on for field-readiness. One-call, 24x7x365 reachback support for FTIR and all of your instruments, regardless of manufacturer.